1. 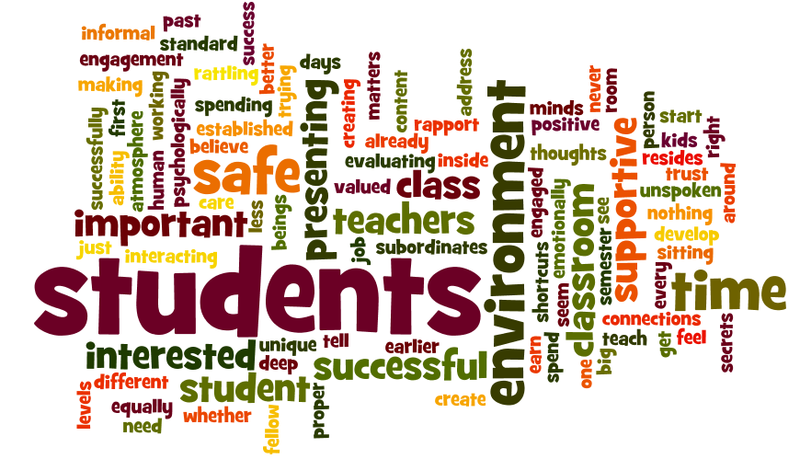 Classroom Policies: At the beginning of every year, students will collaboratively brainstorm and choose their own classroom policies. We will accomplish this by working in groups to identify and clarify student expectations of peers and themselves. These expectations for our classroom will be discussed and agreed upon through consensus. Policies will be posted on the classroom wall for easy reference throughout the year. 2. Survey: I will utilize a preference style questionnaire to encourage students to describe what they need from a teacher, what their learning strengths are, and how they view themselves as learners. I will also ask students to self identify their learning and language accommodation needs. 4. Classroom Routines: Routines will include what students do when they walk into the classroom, how the teacher greets students each day, where supplies are located around the room, and how the desks are set up in the room. These routines will help establish classroom organization and environment. 5. Established Signals: Signals that will be used in the classroom engender effective communication between the teacher and students. Signals will be used when transitioning from collaborative groups to individual work, between topics, and activities for each class period. Silent signals will also be used by students to let the teacher know when they need more time, as well as when a concept is not understood and further explanation by the teacher is needed.